Napoleon Bonaparte (15 August 1769 – 5 May 1821), was a military and political leader of France and Emperor of the French as Napoleon I, whose actions shaped European politics from 1804 to 1814. Napoleon has become a worldwide cultural icon who symbolises military genius and political power. Since his death, many towns, streets, ships, and even cartoon characters have been named after him. He has been portrayed in hundreds of films and discussed in hundreds of thousands of books and articles. During the Napoleonic Wars he was taken seriously by the British press as a dangerous tyrant, poised to invade. A nursery rhyme warned children that Bonaparte ravenously ate naughty people; the 'bogeyman'. The British Tory press sometimes depicted Napoleon as much smaller than average height and this image persists. Confusion about his height also results from the difference between the French pouce and British inch—2.71 and 2.54 cm respectively; he was about 1.7 metres tall, average height for the period (see also Sade's appearance). 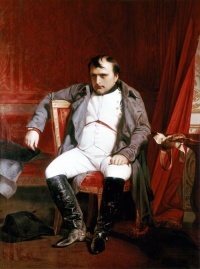 In 1908 psychologist Alfred Adler cited Napoleon to describe an inferiority complex in which short people adopt an overaggressive behavior to compensate for lack of height; this inspired the term Napoleon complex. The stock character of Napoleon is a comically short "petty tyrant" and this has become a cliché in popular culture. He is often portrayed wearing a comically large bicorne and a hand-in-waistcoat gesture—a reference to the 1812 painting by Jacques-Louis David. Ne te lave pas... J'arrive! Unless indicated otherwise, the text in this article is either based on Wikipedia article "Napoleon" or another language Wikipedia page thereof used under the terms of the GNU Free Documentation License; or on original research by Jahsonic and friends. See Art and Popular Culture's copyright notice. This page was last modified 11:44, 3 November 2018. This page has been accessed 13,255 times.